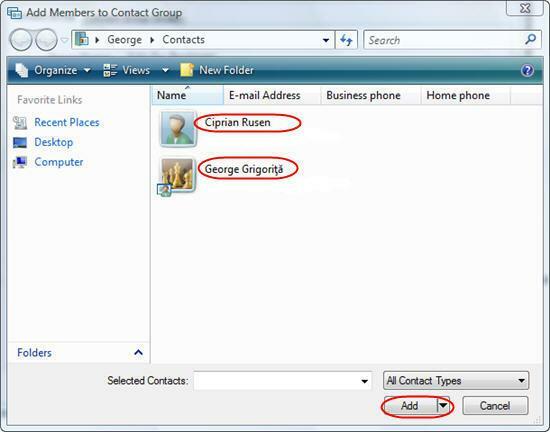 Some of our readers asked us how e-mail contact groups can be created in Windows Vista. To answer their question we have created this tutorial in which we will show you how to do it. In Windows Vista, contacts can be managed by using the Windows Contacts application which replaces the old Address Book from Windows XP. 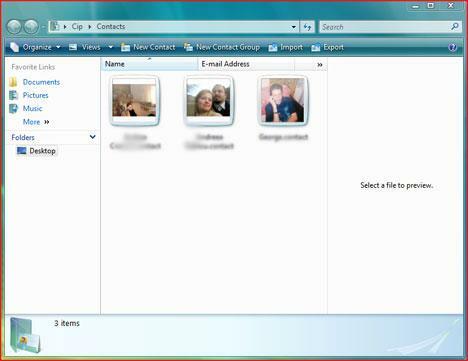 In April 2007 we published a quick overview of the new Windows Contacts application. Before reading this tutorial you might want to check out our previous article to get yourself familiarized with the new application. 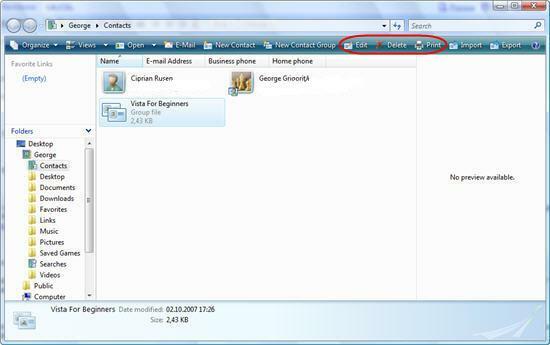 You can access Windows Contacts directly from Windows Mail or from the Start Menu. In Windows Mail, click on the Contacts button located in the menu bar, right after the "Send/Receive" button. In the Start Menu you can find the Windows Contacts shortcut directly under All Programs. Once you open Windows Contacts, you will see in the upper menu bar the New Contact Group button. Click on it. 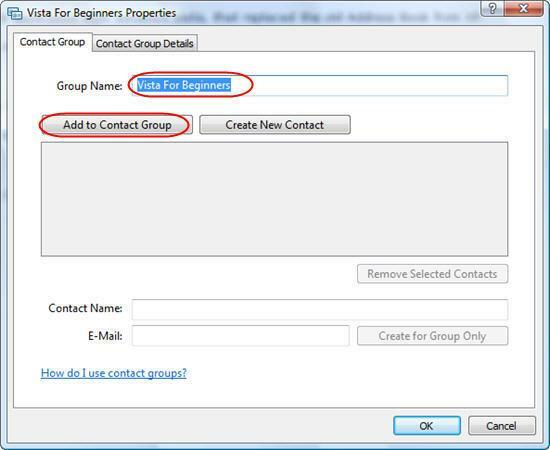 In the Contact Group Properties window type the name of the new contact group and then click on the Add to Contact Group button. Select the contacts that you want to add to this group and click on the Add button. If you want to create new contacts and add them directly to the contact group, click on Create New Contact, add all the contact details and click on OK. You can also add new people to the contact group without adding them to your individual contacts. 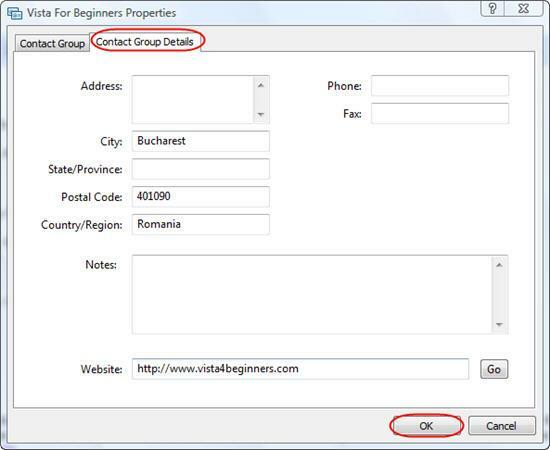 To do this, type the appropriate information in the Contact Name and E‑Mail fields, and then click on the Create for Group Only button. 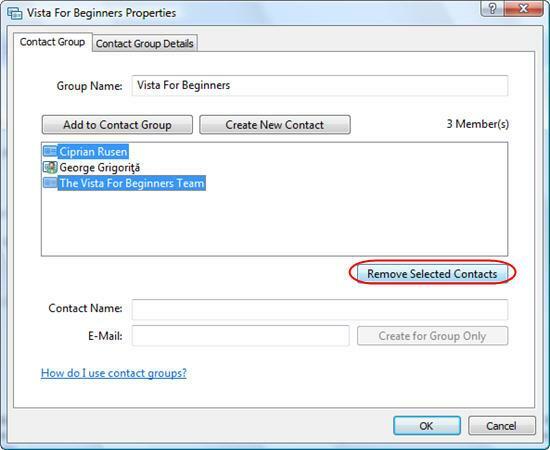 To remove a contact from the group, select it from the list and click on the Remove Selected Contacts button. If you want to remove more than one contact, press and hold the Ctrl key and with your mouse select the contacts. Afterwards click on the Remove Selected Contacts button. 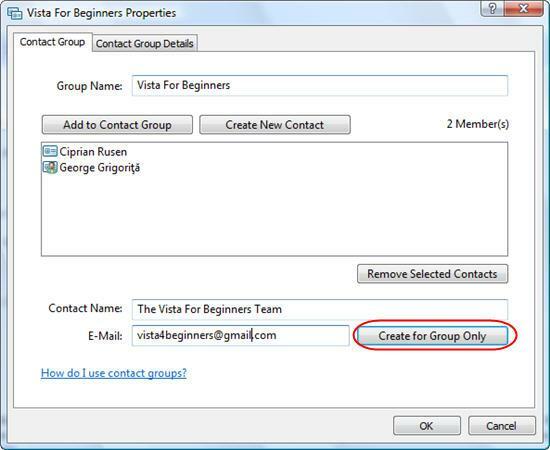 In the second tab of the Contact Group Properties window you can fill in some details about the group you created. Complete the fields you want and then click the OK button. Now you will see the new group in the Windows Contacts list. If you want to make changes to the group, select it and click on the Edit, Delete or Print button. Not sure if I 'm being a dullard but my version of Windows Mail does not show the tabs "New Contacts , New Contact Group, etc". When I open up my contacts I only get the following options "Organise , Views, Slideshow & Burn" & I want to set up a group of contacts, can anyone help ? G'day Pete, I had the same problem. * Right click in the Contacts folder window (in the blank area at the bottom, not on an icon). * Select "Customize This Folder" from the context menu to bring up the "Customize" tab of the "Contact Properties" window. * Under "Use This Folder Type as A Template:" make sure "Contacts" is selected from the list. You are the best! I would have NEVER figured it out. Sometimes I hate VISTA. I was futilely trying to find the contacts toolbar. Thanks for the info. VISTA is far worse than XP. A huge step backwards. I only have "organize, views and burn on my task bar. I have been going nuts trying to find the icon to make a contact group. How do I show contacts list under local folders? Has anyone any idea of how to transfer the contact group to another Vista PC in Winddows Contacts. I've tried the export/import options but that does not transfer the Groups, only the individual email addresses. When trying to compose an email and wanting to select names, the whole contact list comes up. Is there anyway to just be able to select email address from the individual contact folders like in Outlook Express? If not, why even have the separate contacr folders? when I add a name to the contact group and I need to add another name (actually several names), the contact list defaults back to the top of the list, instead of staying were I left off. So I am constantly scrolling down from "A" to the next person. Is their any way to be able to transfer these names without going back to "A"? I could not find a way to quickly create a Dlist by copying n pasting email address in bulk to Create New Contact, in MAIL. Looks like I would be forced to type in each email ... am I missing something here? Who would want to sit and type or add contacts all day...? I have about 100 contacts. 15 of which I want in one list and 85 in a 2nd list. Not group (as defined by meaning, send the same identical emails to a group). Just a prime list and a seldom used list. It was no problem in OE - how do you create 2 lists in Contacts? Also like a previous reader, when you open an email and click To: the entire 100 names come up. I only want to see the 15 prime addresses come up. If pressing CTR is related, I don't understand how? After you remove all of the emails from a group, HOW DO YOU REMOVE THE GROUP??? THE GROUP NAME???? Is there a way to copy and paste from an email To: line directly into a contact group folder. It is very tedious if you are trying to enter email addys one by one into a contact folder, particularly if the group is large (like our local swim team). I would like to be able to just lump them together from an email and create a contact folder. When I do cut and paste, only the last addy will enter the system. On using export and than adressbook it exports only the contacts. Using nearly 50 different groups, i would also like to export those. Anyone some idea? My tool bar in my contacts has changed and I have lost the button to create a new contact group...????? A newbie to Windows Mail and I have noticed the first time I sent an email to my Contact group, the names now also show outside of the Contact group. Is there a way to change that? Thanks for the instruction on getting the Contacts information in the toolbar. Windows Mail help screens were of n help.